The Belgian, as the name implies, is native to the country of Belgium. This little country is blessed with a fertile soil and abundant rainfall providing the thrifty farmers of Belgium with the excellent pastures and the hay and grain necessary to develop a heavy, powerful breed of horse. Belgium lies in the very center of that area of western Europe which gave rise to the large black horses known as Flemish horses and were referred to as the "great horses" by medieval writers. They are the horses that carried armored knights into battle. Such horses were known to exist in that part of Europe in the time of Caesar. They provided the genetic material from which nearly all the modern draft breeds were fashioned. 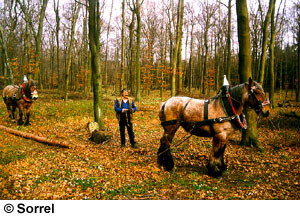 Stallions from Belgium were exported to many other parts of Europe as the need to produce larger animals of draft type for industrial and farm use was recognized. There was no need to import into Belgium for she was the "mother lode." It remained only for this ancestral home of the "great horse," by whatever name, to refine and fix the type of the genetic material she already had at hand. The government of Belgium played a very energetic role in doing just that. A system of district shows culminating in the great National Show in Brussels, which served as an international showcase for the breed, was established. The prizes were generous. Inspection committees for stallions standing for public service were established. The result was a rapid improvement into a fixed breed type as the draft horses of Belgium came to be regarded as both a national heritage and, quite literally, a treasure. In 1891, for example, Belgium exported Stallions for use in the government stables of Russia, Italy, Germany, France, and the old Austria-Hungary empire. The movement of horses out of Belgium for breeding purposes was tremendous in scope and financially rewarding for their breeders decade after decade. The American Association was officially founded in February of 1887 in Wabash, Indiana. The breed offices are still in Wabash. It was slow going for the Belgian until after the turn of the century. 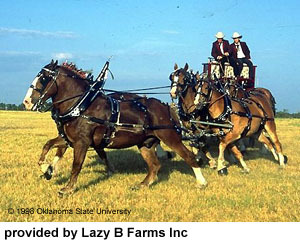 In terms of promotion the Percheron, Clydesdale, and Shire all enjoyed a substantial head start in this country. In 1903 the government of Belgium sent an exhibit of horses to the St. Louis World Fair and the International Livestock Exposition in Chicago. While this effort was attended by plenty of controversy over which type of horse best suited Americans, it also generated great deal of interest in the breed. From that point forward the breed's acceptance grew steadily. The year 1910 shows a total of 1773 registrations with virtually every major importer in the country including Belgians in his offering. That figure was closely approached again in 1913. New memberships which ranged from 4 to 25 in the early years of the century took off dramatically in 1910 with 83 new members, 92 in 1911, 125 in 1912 , and 135 in 1913. In terms of importing seed stock and establishing new breeders, it was none too soon, for the onset of World War I in 1914 brought all importations to a complete halt. Suddenly, American Belgian breeders were on their own. Fortunately, they had plenty of the "right kind" with which to develop their own style of Belgian horse. The post war depression in agriculture retarded the purebred Belgian business in this country for a few years but by 1925 the total of annual registrations again passed the 1,000 mark. A record high for the pre-World War II period was hit in 1937, the golden anniversary of the association, when 3196 Belgians were recorded. It was during this draft horse decline in the 20's that the Belgian moved into a very solid number two position in this country. During the 20's and early 30's the Belgian decline was much less than the other breeds. Thus the percentage of draft horses that were Belgian grew dramatically during this period. The Belgian prospered while the other breeds either stood still or went backwards. Thus, it should not be surprising to know that during the 20's there was a resumption of importing from Belgium on a small scale. With the dramatic upturn in draft horse fortunes in the mid-30's, the importation of horses from Belgium again assumed major proportions for a few years. In fact, the last importation was landed in New York by E. F. Dygert, Iowa importer, on January 15, 1940, four months after war had started and four months before the German invasion of Belgium. 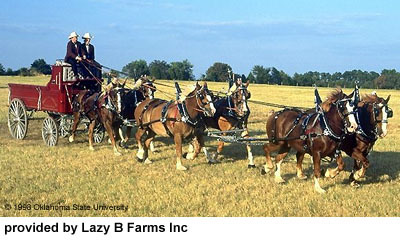 It was about that time that a number of things conspired to very nearly put an end to draft horse breeding of any kind. The labor shortage of World War II, the introduction of small, rubber-tired row-crop tractors, and the tremendous push for mechanization in the wake of World War II put all draft breeds under severe pressure. The decline of interest in draft horse breeding was precipitous, obituary notices were a dime a dozen. The number of annual registrations even dropped under the 200 mark for a couple of years during the early 50's. The other breeds were in even worse shape, a couple of them even closed up shop for a few years. Then slowly, almost imperceptibly at first, the return of the draft horse got underway. As the price of horses recovered so did the breeding. Registrations and transfers made slow but steady gains until in 1980 they surpassed the previous high set in 1937. The average for 1981-85 was 4056 registrations and 5920 transfers ... easily the greatest five year period in the breed's history.